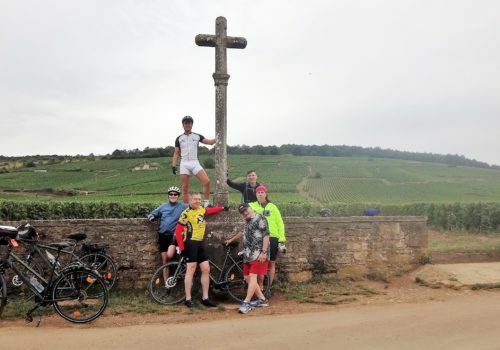 Truly an amazing trip around the Burgundy region of France with a group of other gay cyclists. Take in charming, little villages and towns, go wine-tasting in one of the most famous wine regions in the world, visit the castles, churches and Roman ruins and take in the beautiful scenery found in this part of France. You’ll arrive into Beaune where you’ll be transferred to your hotel and meet some of your fellow travellers. For those that arrive early, enjoy a walk in the afternoon along the medieval protective walls of the town. You’ll take in such sites as the Collegiale Notre Dame church which dates back to 1120 plus a wine cellar where you’ll discover some of the finest wines made in the region during a wine tasting session. Once back at the hotel there will be refreshments and an orientation followed by dinner in a historic venue. Today you’ll start your biking adventure towards Chateauneuf! You’ll set off on your bikes towards Pommard – a quaint little village which is known for its fine red wine – discovering Roman artefacts along the way. You’ll then continue on to Savigny-les-Beaune where you’ll find an impressive moated castle. You choose to cycle along the paved roads with the beautiful views, or you can choose the harder route along the unpaved hiking trail through the forests. You’ll take in the ruins of the medieval Abbey of St. Marguerite and enjoy a picnic on the ground. You’ll continue biking through orchards, forests and fields, past the canal, until you arrive in Chateauneuf – a tiny village with a long history. You’ll start from Semur-en-Auxois castle down to the Burgundy canal, following the route along small, narrow roads. 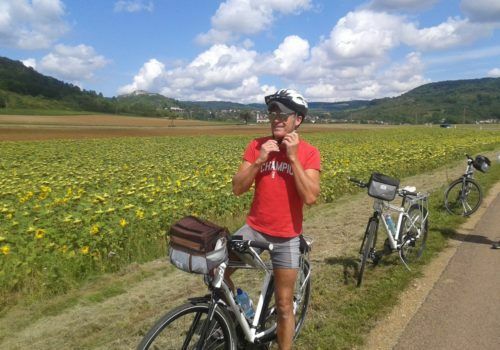 You’ll cycle through small towns and pass beautiful poppy and wheat fields until you reach Eguilly. Here you’ll meet the Frenchman who has dedicated much of his time to renovating the once-magnificent castle. You’ll enjoy a picnic lunch on the ground before you reach the shorelines of Lac de Pont where you’ll find a secluded swimming spot where you can cool off in the sun. Once you are done, you’ll then continue onto Semur-en-Auxois – a medieval town built on top of the towering cliffs in the Armancon river. You’ll have some time to go and explore, taking in the old walls of the fortress and the many small shops, cobbled streets and old buildings. On your second day in Semur-en-Auxois you’ll have different options to choose from. Either relax and take the day at your own pace exploring the many little streets of this medieval town, or take a 35-mile biking trip to a 12th Century monastery, found hidden in one of the sprawling valleys. You can even choose to go biking to the Basilica of Ste. Madeleine for those looking for a longer biking trip, or go hiking around the shoreline and discover some more of the beautiful scenery that can be found here. In the afternoon you’ll enjoy another wine tasting session where you’ll discover more of this region’s finest tipple. Today’s route is one of the shortest of the trip, but arguably the most challenging as you take on the many sprawling hills of the valleys you’ll be cycling through. You’ll head towards Flevigny where you’ll find the remains of a 17th-century abbey and a peaceful medieval town. Be amazed by the restored medieval homes and architecture found here in the filming location for the film ‘Chocolat’. You’ll then move onto Hauteroche – another traditional old town to explore and enjoy lunch in. You’ll pass Roman ruins on your way towards the start of the River Seine before reaching the tiny hamlet of St. Seine l’Abbaye. A shorter route today allowing more time for exploring in between locations! You’ll pass through the historic village of Malain where the castle is undergoing major renovation to bring it back to its former glory. You can get the best views over the town and the beautiful valleys from here as it’s built on the top of a hill. You’ll cycle through some stunning, picturesque canyonlands before reaching the town of Gevrey-Chambertin which is famous for its amazing red wine that is produced here. In the afternoon, enjoy a guided tour of the castle which is still owned by the same family after generations. Today you’ll cycle back to your starting point of Beaune. Along the way you’ll take in quite a few more wine producing towns such as hambolle-Musigny, Vosne-Romanee, and Nuits St. George which you’ll have time to explore and wander around. Once you have arrived in Beaune you’ll be able to do some more sightseeing, taking in sights such as the Hotel Dieu which you’ll probably recognise from a lot of travel guidebooks. 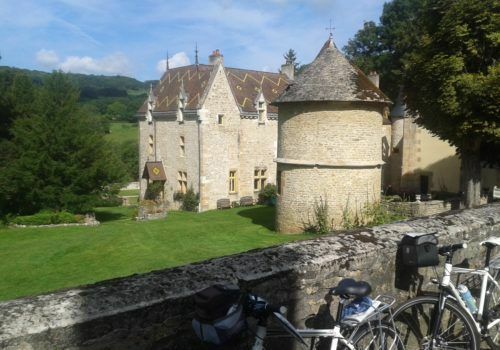 If you wish to cycle on further you can take in some more charming villages by continuing along to the chateau at Rochepot. Today is the end of the trip. You will say goodbye to your fellow cyclists and will be transferred to the airport ready for your departing flight.